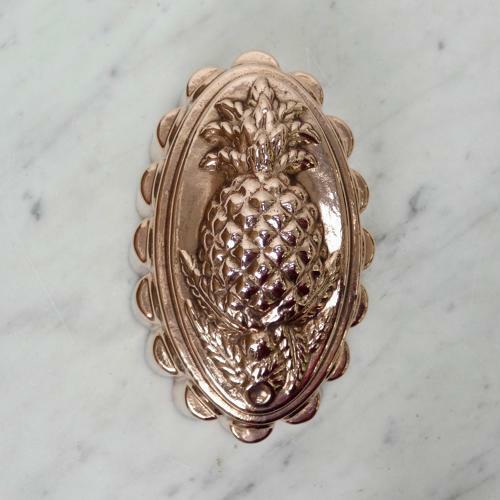 A very good quality, Victorian copper mould with a pineapple to the top. This mould is marked 'MAPLE & Co LTD LONDON' and, to the opposite end is a number '1'. Maple and Co were a quality furnishing store on the Tottenham Court Road, London and the number '1' is Benhams pattern number for this design. Maple would have bought the moulds in from Benhams and had their marks put on them. This mould is made from a heavy gauge of copper and the design is very well detailed. It dates from c.1880 and it is in excellent condition. The tinning, to the interior, is slightly worn but it is still good enough for the mould to be used.